Essential oils are used to make many forms of fragrance. Men and women have been making their own cologne for thousands of years. The ancient Egyptians were known for their many uses of perfume, which they created using essential oils--oils extracted from plants with properties that carry the scent of the plant. These oils can be used singly or in combination to create a perfume or cologne--the only difference, according to online retailer Fragrance Net, is the concentration of oil in the product to its alcohol base. Cologne uses a small amount of oil and a greater amount of the alcohol base, which as it evaporates moves the fragrance from your skin to the surrounding air. With many essential oils to choose from, you can create your own personalized cologne or make a gift for someone else. 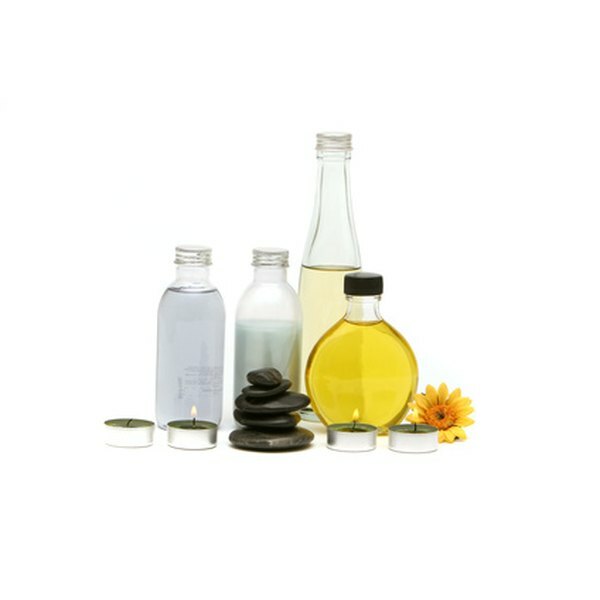 Place each of the essential oils into the glass bottle in the amount instructed. If each bottle doesn't come with its own dropper, be sure to wash your dropper off with a mild soapy solution and rinse well in between oils. Add one cup of vodka to the glass bottle and seal tightly. Shake well. Cut a length of ribbon about 10 inches long and tie it in a bow around the neck of the bottle for a decorative touch. Let the cologne sit for a week in a cool location, out of direct sunlight. This allows the scents to blend to form your fragrance. Shake well before each use. Experiment with different combinations of essential oils or make a single-note fragrance by using just one essential oil. Don't put essential oils directly on skin without mixing them with vodka first or a carrier oil, such as olive or coconut oil. Do not drink the cologne.